B.O. spewed his usual robotic nonsense about the "freedom" afforded women through the legalized murder of their children. Today, as we reflect on the 41st anniversary of the Supreme Court decision in Roe v. Wade, we [who's "we"? Certainly doesn't include over 50% of the voting population] recommit ourselves to the decision’s guiding principle [i.e., the idea that it's OK to murder inconvenient life]: that every woman [except, of course, those women who were murdered in their mother's womb] should be able to make her own choices about her body and her health ['cause "health care" usually means injecting children with saline, chopping up their bodies, and sucking out the parts with a vacuum cleaner]. We reaffirm our steadfast commitment to protecting a woman’s access to safe ["safe" for whom? ], affordable health care [I don't think that phrase means what you think it means] and her constitutional right to privacy [you mean that fictitious right invented in the early 1960's by a bunch of judges? ], including the right to reproductive freedom [good euphemism, except that this "freedom" is bought with the death of a child and destroys all of its freedoms]. And we resolve to reduce the number of unintended pregnancies [why? If abortion is just health care, then why bother reducing its occurrence? Also, I don't think those who profit from unintended pregnancies want their numbers reduced, cf. Planned Parenthood], support maternal and child health [ah yes, b/c there's nothing like plunging a pair of scissors in a child's brain to say, "Stay healthy! "], and continue to build safe and healthy communities for all our children [Abortion pretty much defines what it means to be unsafe in the womb]. Because this is a country where everyone deserves the same freedom and opportunities to fulfill their dreams [Unless you're an inconvenient life then you deserve whatever brutal fate your mother's whim can come up with]. What he really meant to say: "Today, as I reflect on the 41st anniversary of the Supreme Court decision in Roe v. Wade, I want to thank Planned Parenthood for filling my campaign coffers with their blood money. Let's continue to promote the ideology of contraception so that women can continue to become unintentionally pregnant and go to my fav campaign donors and pay them to kill their child. How else can they afford to give me donations? Also, let's not forget that we need to use medical jargon and the rhetoric of rights and freedom to hide the fact that abortion snuffs out a human life. Here's to another 1.7 million dead babies in the coming year!" March for Life 2014. . .Archdiocese of New Orleans! OP's from every continent in DC! 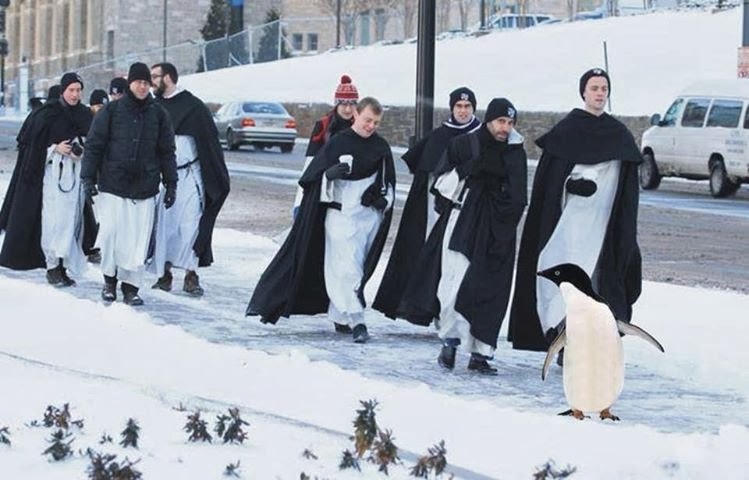 Friar Penguinus Mary, OP joins the March for Life! All 500+ Archdiocese of New Orleans marchers made it back safely from D.C.
Yours truly has been awake for almost 48 hrs. I'm hallucinating. . .I think. Anyway, the March was a HUGE success. Despite single-digit temps and the remains of a snow storm the night before, some 600,000 marchers descended on D.C. to let the Devil know that his "pro-choice" agenda is NOT the agenda of the next generation. Though Catholics dominated the crowd in terms of numbers, I saw banners for Lutherans, Methodists, and Orthodox Christians. The Pro-Life movement is truly ecumenical. Thank you for your prayers and support. . .
Now. . .time for bed!